We want our brands to be enjoyed with family and friends in a convivial atmosphere and there is no conviviality without moderation. We make our drinks with great care, enjoy them the same way: this is all about smart drinking. Therefore, we promote a moderate drinking lifestyle, we campaign against drink-driving and drinking during pregnancy and we make young people aware of the risks associated with alcohol. But most of all, we pride ourselves on having the best ambassadors of Responsible Drinking, our employees. Pernod Ricard UK invests heavily in responsible drinking organisations. We are a founding member of the Portman Group, a Board member of the Wines and Spirits Trade Association, a Principal Sponsor of Best Bar None and we are delighted to be a key funder in the leading alcohol education charity Drinkaware (see below). We fully embrace our own responsibility in helping consumers to make informed decisions about drinking alcohol, alongside government, law enforcers and parents. We also believe that alcohol issues cannot be resolved without consumers accepting responsibility too. This approach led to the conception of ‘Accept Responsibility’ in 2008. The campaign challenges consumers to accept responsibility for the choices they make about drinking alcohol. The campaign has focused on relevant and important drinking issues in the UK, including: binge drinking, underage drinking and drink-driving. 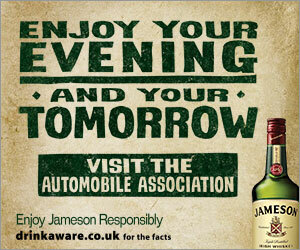 Joining forces with the Automobile Association in 2010 has strengthened our commitment to the prevention of drink-driving, including a successful campaign with Jameson.